I for one, need editing. Without it how good could a work be? Unless, we’re like the guy from the Limitless movie, writers need editing and editors. Grammatical errors, plot holes, and the like can turn off a reader. It’s like getting your mouth set for the popsicle in the freezer only to find your spouse ate it already. I don’t know of anyone who gets excited about reading something full of errors or a plot that’s confusing or has gaps. The Writer’s Digest has some great advice on editing. Things like taking a break between the first and second draft to refresh, asking the right questions after a read-through, and enlisting the help of beta readers or editors can make the difference between a good story and a great book. Check out the link above for more insight. Late last year, I became a member of the Women’s Fiction Writers Association (WFWA). I wanted a more centralized place to learn about the craft and industry as well as commune with fellow writers of the genre. So far the experience has been wonderful and very beneficial. In fact, the WFWA has a program called Write-a-Thin (WAT) taking place in February. I will be participating. Wonderful tips! Nice way of using dance terms to describe how words should flow. I must admit, I’m guilty of adding the words “beginning to” or “starting to” in my works. I don’t think I knew or realized the impact until reading this post. Thanks Alicia! Typos and errors can happen to the best of us. It’s understandable. The problem I have is when there are so many errors and typos that it’s hard to read. I’ve put down a couple of books for this very reason. I originally published this article as a guest author at http://timothy-oullette.blogspot.com/ and http://www.timouellette.com on August 8, 2014, but I felt that the information was important enough that I wanted it in my blog feed as well. 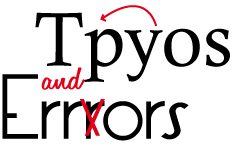 I hope you enjoy my take on Typos and Errors in Indie-Published Manuscripts. You can let me know what you think by leaving a comment below. Are typos in a book a big deal? AUTHORS – Help ME help YOU!